With an obvious namesake, Fort James Jackson opened in 1811 in its Tybee Depot location. Located just minutes from downtown Savannah, this restored 19th-century fort is located along the Savannah River and was first created by architect William McRee. 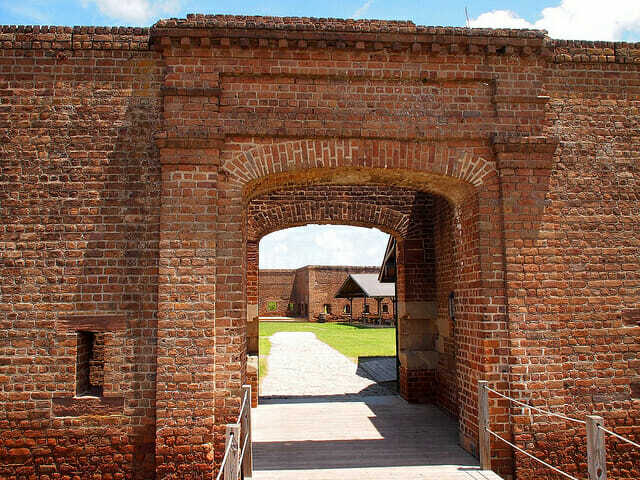 This National Historic Landmark serves as the oldest standing brick fort in the state, as well as one of the oldest along the East Coast. The fort provides unique views of the riverfront as well as a rich history ready to be shared. Fort James Jackson is located right next to Fort Pulaski, historic Tybee Lighthouse, and historic Cockspur Lighthouse, so if you would like to stay awhile you can truly immerse yourself into years of important Savannah history! Fort James Jackson allows you to walk on the grounds of the same East Coast fort that was needed in 1808 when locals were dealing with bad British Blood and a worsening war situation. The fort served triumphantly through the War of 1812, as well as the American Civil War. Once used as protection from naval attack, today this site provides exciting interactive programs for adults, kids, groups, and families! Watch the exciting must-see daily cannon firings before you head over to the CSS Georgia, sentry box, or sally port. It is recommended that you spend about an hour touring the location, taking in all the history, city relationship information, weapon exhibits, and fort facts you can along the way. Stop by the gift shop on your way out, or just stroll along the river and ramparts for great insight on the surrounding location!